Early Monday, Denver Broncos announced the release of 1,000 yard rusher C.J. Anderson. Anderson began his career with the Broncos as a 2013 undrafted rookie and won the starting running back job in 2014. Anderson made the Pro Bowl that year and helped the team win its third Super Bowl in 2015. In 2017, he set a new career high in rushing yards with 1,007. Anderson‘s $4.5 million cap hit for 2018 led many to suspect the Broncos could part ways with their leading rusher. 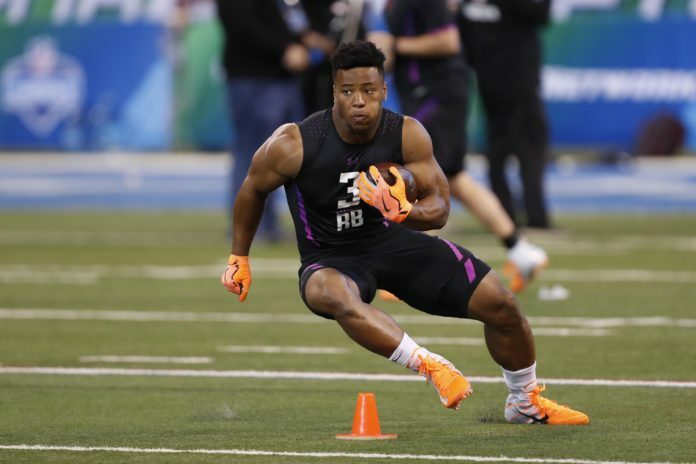 After failing to trade Anderson, his release potentially opens the door to draft a once-in-a-generation player in Penn State’s Saquon Barkley. Barkley was already a highly-rated prospect when he declared for the draft at the conclusion of the college football season. It was his historic performance at the NFL Scouting Combine that skyrocketed Barkley’s draft status to a sure-fire top-five pick and the Broncos would benefit greatly from Barkley’s services, if he were to fall to them. While the Broncos’ front office has expressed confidence in third-year back Devontae Booker, Booker has far from proven that he can handle the workload of a starting running back. Backup running back De’Angelo Henderson — while talented — only appeared in one game last season – the Broncos’ final one. The only other running back on the roster is Andy Janovich, who has played exclusively fullback in his short NFL career. Anderson’s release creates a void that Barkley would fill immediately. There are more merits to drafting Barkley in addition to getting one of the best running back prospects in recent memory. Drafting Barkley — a a running back with enough talent to become a perennial Pro Bowler — would allow the Broncos to have their backfield solidified for years to come. A strong running game would keep the pressure off new starting quarterback Case Keenum this season, and would further ease the transition of a new quarterback if the Broncos decided to move on from Keenum in the future. The Broncos don’t pick in the top five often. The last time they drafted this high was in 2011, when they drafted second overall (Von Miller). This is a rare opportunity for the Broncos that they cannot afford to waste.